Remember the old Journey to the Center of the Earth movie, with the optically enlarged lizards presented as dinosaurs (colloquially termed "slurpasaurs")? That was what passed for a nifty special effect in 1959. Today it's 3-D effects. Of course, audiences of today are far too sophisticated to fall for lizards with horns and fins glued to them; in the age of movies like Jurassic Park, only a digitally animated Gigantosaurus will do. This latest incarnation of Journey is surprisingly true to its roots: Trevor Anderson (Brendan Fraser) is an absent-minded volcanologist who is spending ten days with his nephew, Sean (Josh Hutcherson). Trevor's brother and Sean's father Max disappeared a decade before looking for the center of the Earth. Max left behind sensors that detect geological shifts in the Earth's crust and a cryptic series of notes in a Jules Verne novel (guess which one?). When one of the sensors fails in Iceland, Trevor decides to go on an adventure in 1950s fashion, bringing along his plucky nephew for the ride. Accompanying Trevor and Sean is the fetching Hannah ¨¢sgeirsson (Antia Briem), the daughter of another volcanologist and the only person with any spelunking skill whatsoever. While checking on the device, lightning strikes, our heroes dive for cover, and from there it's a lot of falling, screaming, and running. This is a 3-D movie, which means that at various times and for no reason whatsoever, something flies straight at the screen. Since you will likely not have invested in the expensive 3-D glasses and you may not have even had the good sense to rent the 3-D version, this makes the movie seem even dumber than it is. The other surprise is that despite the dinosaurs and the hottie, this movie is aimed at a younger set. The dialogue isn't very good, although Fraser does his best. Sean is meant to be a wisecracking preteen modern hero, but he reverts quickly to type. Scenes that are meant to be scary are played up for laughs: giant venus flytraps get pummeled in wrestling-style fashion, flying killer fish get batted away like softball practice, and there's a long and pointless mine cart sequence whose sole purpose is to show off the 3-D effects of the glasses you didn't buy. Did I mention the irritating glow-in-the-dark mascot? There's a bird. It follows Sean around. Only he can understand it. And it glows in the dark. Don't try to play this on an old fashioned CRT TV set - it won't work and will give you a headache. Put this DVD in your COMPUTER's DVD Player and get ready to be blown away. I upgraded monitors and both worked perfectly. My LCD HDTV would have worked better and be bigger, but I never got the colors to match up as perfectly as they did on my Computer's WS LCD (Media Center 2005). You get 4 pair of Red-Blue glasses, which, although, sometimes one would wish that the Set Directors would have chosen better set and costume colors for this Anaglyph version of the 3-D Polarized version that was shown in Theatres, the effect is surprisingly viewable for those who don't mind getting a headache from focusing on things as the scene changes. This should be a wake up call to all those 3-D movies that were released in Theatre's in the 50s. "Creature from the Black Lagoon" would be stunning. MORE 3-D, MORE 3-D~! 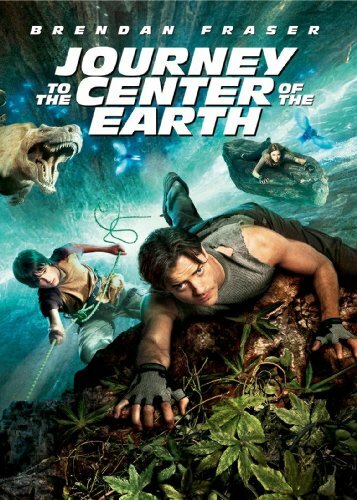 I first saw Brendan Fraser's "Journey to the Center of the Earth", soon after its 2008 release, on a flight to Budapest. I knew in only a few minutes into this adventure that it is destined for greatness. I was simply delighted to learn that a 3-D version was to be released as DVD. The 3-D version makes this great flick better! Everything across the screen literally jumps out at you. You will want to retrieve you favorite 3-D specs and watch it in a dark room. Fraser, Hutcherson, and Briem give stellar performances with the Weiss, Flackett, and Levin screenplay that follows Jules Vern's original novel. As the characters progress deep down into the earth we learn applied science while being entertained by science fiction. We see diamonds galore in volcano tubes, luminescent birds, hungry sea monsters, floating rocks, and even a crazed T-Rex. 3-D adds to this excitement. (One hopes that these moviemakers will indeed make a sequel- hinted about Atlantis- in the final scene). With no foul, or even curt, language and a short flirtive, but not suggestive, romance this action packed flick is the best movie of 2008. It is a great date movie and recommended to adventure movie lovers of all ages. We rented this for family night at our house. i wasnt too sure which way it would go. Another cheesy kid movie or one that my child couldnt watch. we were all glued to the tv, laughing and having a great time. I really like Brendan Frasier and that's what attracted me to this film. While I do enjoy his humor, in a nutshell it was sort of a yawner for me. I'm glad I watched it but it's not a movie I'd recomment to anyone over say 17. I am a fan of Jules Verne, which is why I wanted to watch this movie. The special effects are fantastic and storyline is decent & fun throughout the movie. It is also action packed and this is good. I think this is a good movie for children too. The acting by Brendan Fraser is simply awful. The poor man can't act (in my opinion) and the rest of the cast was alright in terms of their acting skills. I wanted to see this when it first came out, and I'm glad I didn't. This film seemed like one big advert for a universal studios feature ride. There was zero believability whatsover as the main characters fall for thousands of yards and like cartoon characters survive without bumps or bruises. Sled on the fossilized skull of some unbelievably large dinosuar, ride a broken coal cart like it was a roller coaster etc. The main characters were likeable. The absent-minded professor, the trailguide, the unhappy nephew. But everything was dumbed-down and cartoonized presumably to appeal to an audience of children. I found myself fast-forwarding scenes where characters were constantly yelling and screaming as they were being chased and hounded, an the really sappy scene in the middle. Kids might like the action-y bits. Myself, I found it got old about halfway through. 2 stars. No where near the orginal. Get the orginal if you want a story. it was ok, kind of fun to watch being in 3D but u still see weird colors when you're watching it and it seems like the 3D animation wasn't done that well. I watched a 3D movie when I was in disneyland and it was done much better. I bought the JTTDOTE DVD the day it came out and returned the next day. I only bought it for the novelty of the 3D and was astonished at color shifts during shots, only seldom working 3D and the ugly colors it produces. Truly awful. I saw it in a theater and I think this new 3D is in big trouble if theater owners insist on diming their projectors to save money on bulbs. It was so dark, thanks also to the polaroid sunglasses that must decrease the light by at least two stops (camera reference) I hope Cameron's Avator 3D epic doesn't have this problem. Spy Kids 3D works much better. This movie really stinketh!! Don't ever invest in such trash such as this piece of trash!! "I agree," added expert movie critic, Johnny J. Johnsonson. Don't ever buy this movie for your granddaughter/grandson .